In this small game we have another crack at Ganesha Games Flying Lead rules. As it was a club game I have only a couple pics but will give the general thrust of the action. The time is April 1968, the Rhodesians have launched Operation Cosmic to snuff out an insurgent Zambesi crossing, having been distracted by the relatively large Operation Cauldron which is still under way. 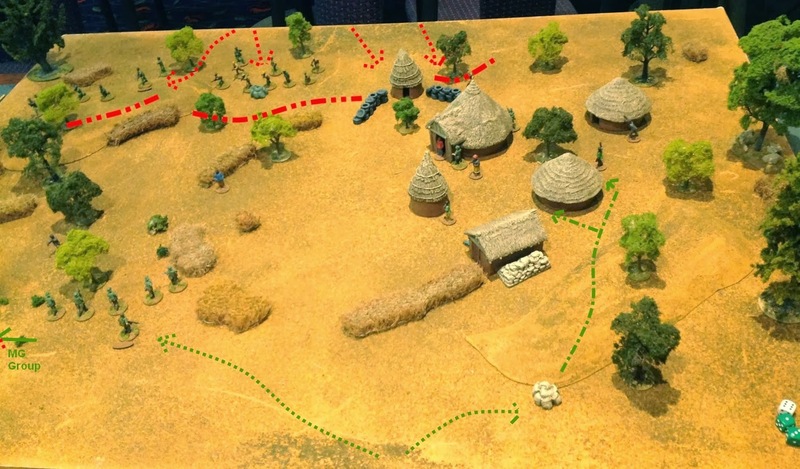 In this action a section of infantry from the Rhodesian Regiment has been tasked with finding a number of weapon caches that the locals have told the police exist in and around their village. The scenario was one adapted from the Ganesha Games Hearts and Minds Afghanistan supplement. 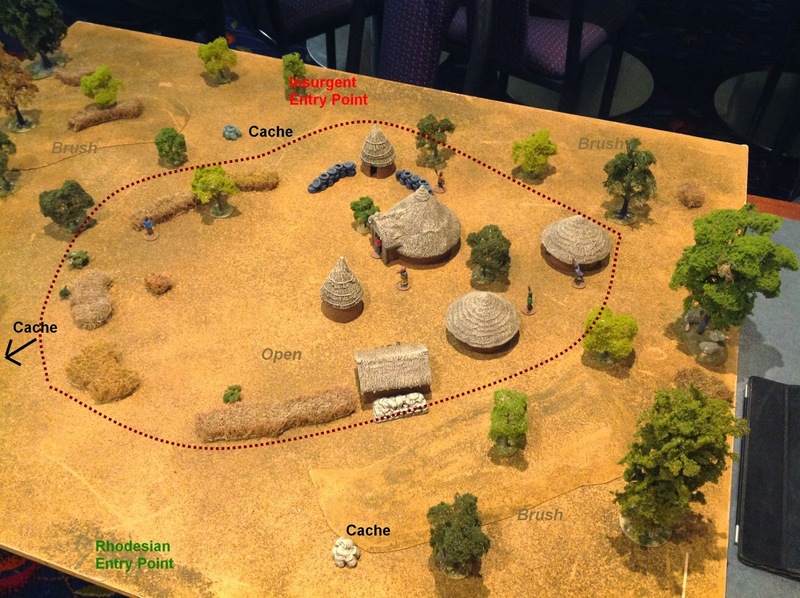 The Patrol scenario was pretty generic and applicable to the Bush War so I adjusted it for the clash. ..this is the scenario as adjusted…. The SF troops are conducting a patrol into an unfriendly area to get information and touch base with the locals. They are joined by two members of the local tribe to act as interpreters. The table is set up as a patrol area, preferably with a number of buildings and 4-10 locals scattered around the table. SF forces enter the board from the middle of one edge of their choice. This point is their safe extraction point. There are three objectives (caches) placed on the board (two by SF player and one by the CT player). These can be particular points of interest or local figures/stores etc. Each objective must in placed up to 1 Medium from the centre of one of the table quarters. The SF forces gain VPs for every objective they get too and spend two actions interacting with. Meanwhile ‘Mujibas’ will be keeping a watch out for the SF force, reporting information to the nearest CT leader. After each SF activation the CT player rolls a die: on the first turn the local CTs are informed on a 6, on the next turn a 5/6, then a 4/5/6 for each following turn. Once they are ‘informed’, they appear from a random table edge the following turn. The game lasts until the CTs retreat or the SF troops leave via the extraction point. 5VP each objective interacted with OR in the case of the CT denied to the SF. We also included the ‘Joy of War’ cards adjusted for the Bush War…actually most of them work in pretty easily. A player draws one when, on an opposed die roll, he doubles the score of his opponent at the end of a turn….these mix things up a bit! This consisted of a central Kraal surrounded by outlying brush and scrubland. We classify the scrub as not limiting movement but visibility is restricted to three times Long (i.e. the ‘Long’ measuring stick used in the game which is 18cm…3×18=54cm ) as it is hard to see too far in even relatively open brush. The game commenced with the Rhodesian platoon seargant entering on his base edge. He called in the MG group and they moved out quickly toward the left hand objective. He then pushed out two troopers toward the objective to his right. These objectives were pretty close to his deployment so it looked quite easy to inspect these and gain some quick victory points. Aware of the entry of the Security Forces it wasn’t long before the first guerrillas appeared. These arrive from a random direction (which can really mix things up) but ended up coming on opposite the Rhodesian forces, thereby setting up a frontal encounter between the two sides. After a couple of activations the two caches had been inspected and the Rhodesians at this point had fulfilled enough victory conditions to achieve a “very minor victory” (more on this later). The guerrillas then started getting quite aggressive. Realising the only way for them to achieve a win was to inflict SF losses they unleashed a hail of bullets, concentrating their fire, which hit the MAG gunner causing him to go ‘out of action’ and also killing a troopie outright…nasty! With these first casualties the Rhodesians started turning on some concentrated fire of their own. Moving up the rifle group they inflicted a couple of kills on the ZIPRA cadres and one of the troopies from the MG group remanned the gun and got it going again. The rest of the ZIPRA cadres had arrived by this time and they too started laying down a little bit of deadly concentrated fire with their venerable SKS carbines…dropping a troopie from the rifle group….three Rhodesians down! …all but breaking the back of the guerrilla force. … all but two guerrillas bomb shelled which ended the action…..
As with all Flying Lead games a quick and ‘sharp’ action – game time was 1.20mins…2 hrs set up to pack up. Using the victory points system in Hearts and Minds it was actually closer than it appeared. The two dead Rhodies and two out of action troopies count for almost the cost of two to three fleeing insurgent cadres each so from a ‘propaganda’ point of view it was still a Rhodesian victory but it was measured. The game once again pretty much worked fine but a few points in this scenario were raised. The placement of the caches is too easy for the SF player to do at game start. We thought on an idea to move these around once placed to mix up their location a bit….maybe after they are placed then doing a quality roll and for each success more than failure you can move the cache a medium distance…easy and in keeping with the rules? The concentrated fire is a deadly mechanic. Maybe this is OK for some periods but to me it seemed like the absolute preferred option and from an historical point of view seemed to perhaps allow to much control for the Insurgent forces…they simply weren’t trained to this degree. Maybe some of the more experienced cadres could reasonably deliver fire like this…not sure…but five guys shooting at one figure is almost a certainty to inflict losses..this in my view is not necessarily in keeping with the period and largely negates the Poor Shots trait which is critical to making the insurgents fire as they did historically i.e. spray and pray…they simply did not co ordinate fire like this. Whilst still not convinced, I’d be inclined to limit the group fire mechanic to perhaps three men total for Insurgent forces or simply disallow it….probably limiting it would be best based on quality. It’d be worth another try to see if this is too powerful as a period specific rule to allow them the five men to concentrate fire…we do have to be careful to strike that balance to make a game of it for the insurgents as well!! So all up, pretty good fun and and lots of small high and low points for each side….good stuff.